SEVEN young people from New Lodge Youth Centre jetted off to Romania this week intent on changing people’s lives for the better. Now in its third year of existence, the Romania Project, in association with Ashton Community Trust, enables young people aged 15 to 18 to participate in projects at home before taking their experiences abroad. In preparing for their visit to Baraolt, the team have been working hard helping others and taking on the task of fundraising to make the trip happen. Young people have been volunteering one night per week in 174 Disability Trust Project and with the Homeless Aware organisation to tackle the issue of homelessness. 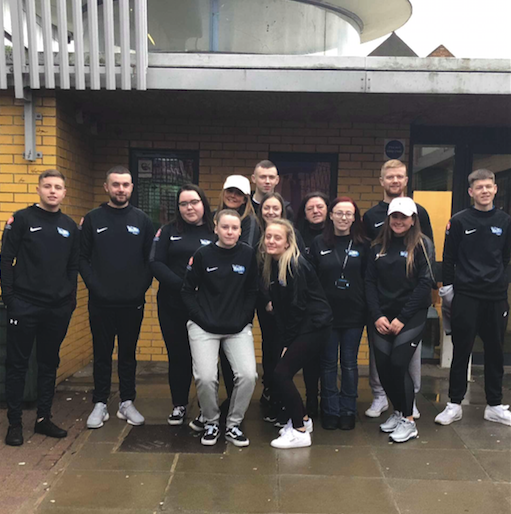 The young people have taken to the streets of the city centre on numerous occasions to provide much-needed drinks and food whilst also helping at the soup kitchen at St Patrick’s church. They also gave up their Christmas morning to volunteer their time helping at the soup kitchen for those who were alone on Christmas Day. Their work in Romania will be in orphanages, disability centres and in local schools. “These young people have been committed over the past nine months to the Romania programme and they have been a privilege to work with,” said New Lodge youth worker, Sean McMullan. “The young people have not only developed and helped themselves but helped so many others and I cannot wait to see the impact that they will have on the people of Baraolt in Romania. “One of the strengths of this group is how much motivation to all tasks they have shown whether that be helping others or fundraising to make the trip possible. “I hope that the young people take the learning they have gained from the project beyond its duration and for the rest of their lives. “The staff team have also been a massive support in helping the young people throughout their journey so far with their dedication and will to support the young people. “I would also like to thank everyone that has supported us throughout the past nine months as the trip would not have been possible without the support we have received from others around the community”. Patrick Downey, a participant in the Romania Project, said: “The Romania Project has been without doubt one of the best things I have ever taken part in. “I have done stuff that I would never have pictured myself doing, like volunteering down at the St Patrick’s soup kitchen, going round the streets of Belfast helping the homeless and also helping out at the 174 Disabilty Trust which has been amazing. Doing this has pushed me a lot to become a better person and has also helped me make so many friendships within the group which is brilliant. PIPS expressed their best wishes to the group ahead of their visit. PIPS Families Group helped collect resources that will be distributed to those in need. Patricia Perry from PIPS Families Group said: “It is a privilege we could help such a wonderful group of young people.